On February 25, 2019, at 4 PM, amidst shouting of slogans, waving of the national flag and hugs, two Tunnel Boring Machines (TBM) ended their successful journey in record-breaking time – within 11 months. For the Ahmedabad Metro Rail Project, Gujarat Metro Rail Corporation (GMRC) Limited is constructing a 6.35km-long underground tunnel in the walled part of the city, where more than 60% of the work has been completed. Ahmedabad, Metro Rail News: The underground (UG) section of Ahmedabad Metro Rail Project, Phase-1 of GMRC starts from Apparel Park Depot to Shahpur for a stretch of 6.5 Km which includes tunneling by TBM (Tunnel Boring Machine) and 4 underground stations at Kalupur, Kankaria, GheeKanta & Shahpur of East-West Corridor. The underground section was divided into two contracts, 2.5 Km of UG-1 contract was awarded to M/s Afcons Infrastructure Ltd and 4.0 Km of UG-2 project was awarded to Ws L&T Ltd for construction of UG stations & tunneling by TBM method. At present 4 TBMs are working in underground sections of GMRC and 60% of tunneling work has been completed till now. Construction works at all 4 UG stations is in full swing. GMRC UG-1 contractor M/s Afcons Infrastructure Ltd had launched the 1st TBM (5-710) in the shaft near Apparel Park Depot on 5th April 2018 and 2nd TBM(S-1134) was launched on 20th June 2018 at the same location. These two TBMs of M/s Afcons, TBM 1 & TBM 2 (with diameter of 6.63 meter) have completed twin tunnels (Up & Down) from Apparel Park depot to Kalupur UG Station over the period of last 10 months. The tunneling work was carried out at the rate of 6 to 7 meter/day on an average in spite of challenging geological conditions in densely populated old Ahmedabad area of Gomtipur, Sarangpur, Kankaria east and Saraspur. 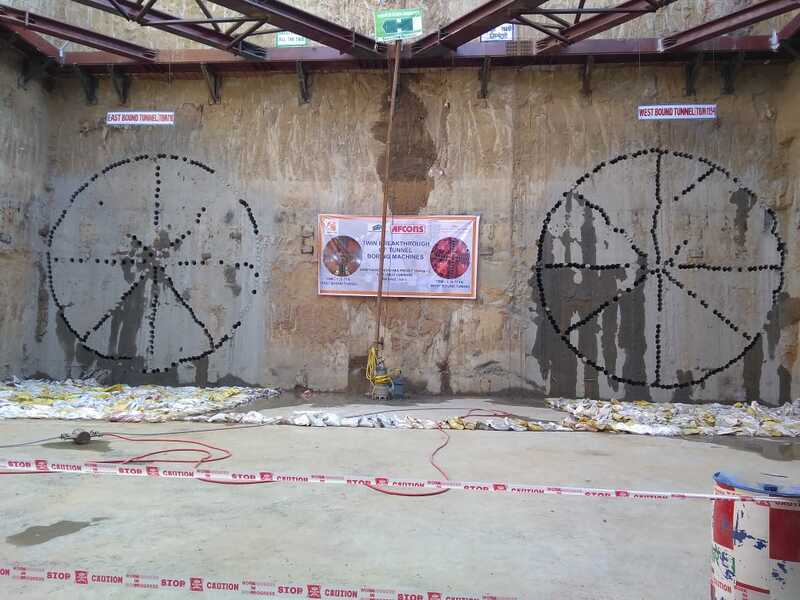 Both these TBMs have done breakthrough on 25th February 2019 at 16,00 hrs, in shaft of Kalupur UG station at the same time which is rare in the industry. This breakthrough has marked the completion of TBM work in this UG 1 project portion by GMRC and other works like cross passage, first stage concrete for track plinth etcetera will commence now.